A while ago I attended a conference and one of the vendors gifted me a classic pocketbook moleskine. Since I tend to write in big size journals, I didn’t use it right away. But I have now discovered that it’s the perfect writer’s notebook. The inspiration to crack it open came from listening to the Creative Non Fiction Podcast (by the way, this is a GREAT podcast for every non-fiction writer, including memoirists.) The host, Brendan O’Meara, was interviewing Austin Kleon. Austin explained that he always carries with him a pocket notebook to write quotes from what he’s reading and quick ideas. Then every morning he writes five to seven pages on a bigger notebook. He finds topics for his blog posts, social media, and newsletter in both of those writer’s notebooks. 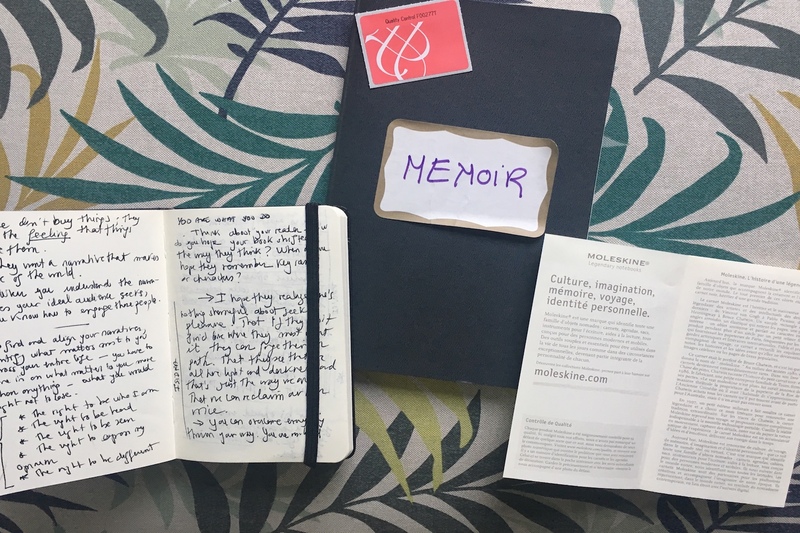 Inspired by his method, I cracked open my moleskin pocket notebook and started using it throughout the day, to write quotes from what I was reading and capture ideas for blog posts, and for the memoir I’m revising. I fell in love. It really is small enough to carry in your back pocket. The pages open wide, but the construction is sturdy, so you don’t risk ripping them off. It has an elastic band to mark where you left off. It offers an internal expandable pocket inside the back cover where you can file mementos such as a concert ticket, a piece of newspaper with something that caught your eye, or an evocative photo. It feels soft to the touch. Every detail has been carefully thought out, up to the rounded corners that seem to caress the inside of your palms. This is not a journal to write long-winded morning pages, philosophical reasonings, or complete stories. It’s the real writer’s notebook, that is, intended to take quick notes on the go, which is exactly how artists of the past used it. Travel writer Bruce Chatwin was a big fan. It was him who gave the little black writer’s notebook the name “moleskin.” When he found out the maker was going out of business in 1986, he went to every stationary store in Paris and bought all the inventory left. Then he wrote about its demise in his book The Songlines. You may wonder what “moleskin” means. Well, in this case it’s not “the skin of a mole used as a fur,” which is the first definition given by the Merriam-Webster Dictionary (phew!). It’s “a heavy durable cotton fabric with a short thick velvety nap on one side.” See? I wasn’t kidding when I said it was luxuriously soft to the touch. I’ve had an on-and-off love story with journaling. I’ve gone from journaling daily to not touching a diary in months. At times my journal becomes such a hopscotch of topics, I can never find anything afterwards (Brendan O’Meara gave a great tip on his podcast for this problem—he indexes all the topics on the back of his journals. Genius!). Other times I keep up to five journals at once: a writer’s notebook about the memoir I’m working on, another writer’s notebook with observations that may be useful for a future piece, a journal of quotes and notes about what I’m reading, etc. Give me a hand. What pen do you use on your journals?